I don’t care what anyone says, red wine is a brilliant training strategy! Case in point: About two months ago, Mario and I had dinner with friends on a Saturday night. 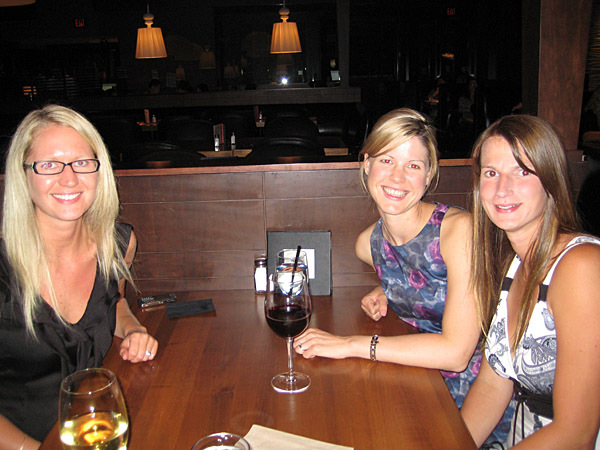 Every time the four of us get together, we usually share a bottle of wine, sometimes two. But this was the first get together since starting my training, and I was a little worried about my wine intake, but I figured, meh, I could get away with a glass, maybe even three. And I was right. The next morning, I had a killer LSD run. My legs felt fresh, I felt super speedy, it was like I was Princess of the World! But last night, when I went out with a couple of old girlfriends of mine, who I’ve been friends with since we were 15, I again had concerns. The three of us hadn’t seen each other in months, and I was really excited for the get together, but I was also kind of freaking out, because a) I’m a creature of habit, and knew I wouldn’t be getting my Saturday tried and true cup of pasta with olive oil and parmesan, and a chicken breast with fresh rosemary, and Greek salad for dinner, and b) because whenever Ashley and I get together, we love our wine together, and c) because 29 km is a whole lot more running than say 13 km! It turns out, though, my worries were totally unfounded. It seems my red wine theory is gaining more and more steam with every sip I take – I rocked today’s run! The red wine, along with the endless water intake, however, might have been the cause of my ongoing full bladder. I hit up two washrooms on the way in (Whatcom McDonald’s = best toilet paper EVER!) and then 4 km into the run, I had to stop again at the last possible washroom facility for another 25 km. And still, my bladder did not find relief. And you know how when people talk about having to pee, it makes you have to pee that much more? Well, I wasn’t the only one who had to pee – there was lots of talk about having to pee! I tried not thinking about it; it didn’t work. I tried thinking of deserts and shortbread and sandpaper to take my mind off of it; it didn’t work. I tried doing kegal exercises; it didn’t work. 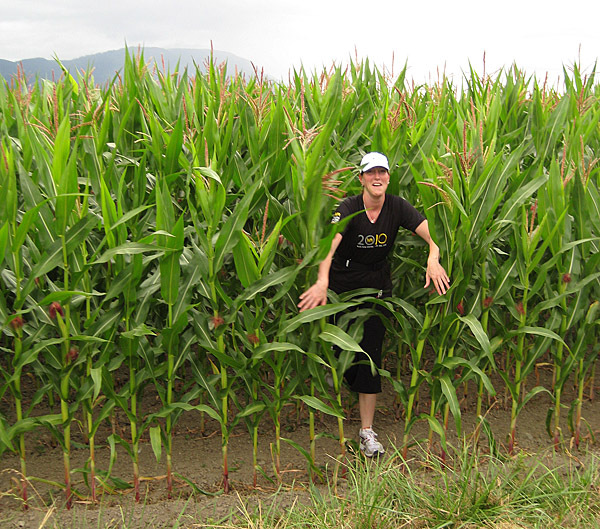 And then, I started eyeing the corn – those seemingly, never-ending fields of taller than human stalks that extended for kilometres and acres back and across. I looked at them, I looked away, I looked back at them, oh man, I was practically doing the pee dance! 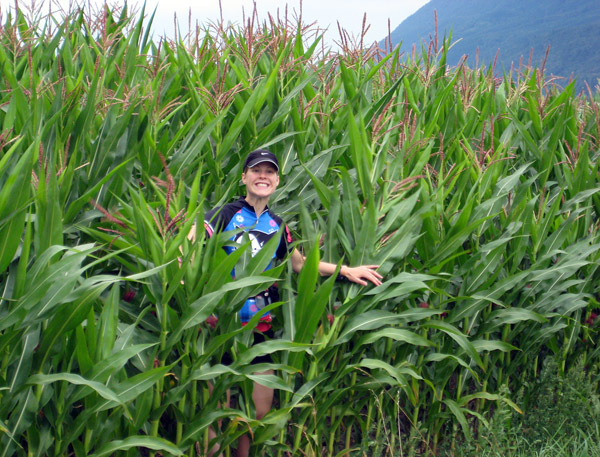 I’d never peed in a cornfield before though. What if an old lady in a muu muu came running out with a broomstick to bat me away? What if I got corn weavels crawling up my nether regions? What if a brood of Kool-aid-drinking, satanic kids appeared out of nowhere with farm tools in hand wanting to decapitate me? Oh I couldn’t possibly do it, no, no I couldn’t. I was ready to hold it, oh yes I was, I didn’t care about no stinking risk of a bladder infection, just as long as my head stayed intact. But then, Tonya piped up, “I’m hitting the corn,” she said. Well, if she could do it, I surely could too! I survived and I didn't pee on myself! Woohoo! It’s amazing how a shift in temperature can change a run, hey. Last week, we were running in like 34 degree weather and it was brutal. This week, we were running in temperatures that ranged anywhere from 13 degrees to 17 degrees, and while my legs still got fatigued at around the 20 to 24 km mark, the run felt like it was just flying by. I think I looked at my distance once at the 20 km mark; the sign of a great run indeed. And even better, I ended the run with a sprint – uphill. Carol and Tonya had surged ahead about a half kilometre before I started to increase my pace at the start of the hill. And as tired and stiff as my body was feeling, I was pretty amazed at how fast my feet were turning over, trying to beat all hell just to pass those speedy girls ahead. I got close, but not close enough. My fastest speed was 5:00 min/km! Pretty impressive, if I do say so myself, especially at the end of a 29 km run. I did, however, have a few issues with my blood sugars in probably the last 8-10 km of the run. About 15 minutes before starting they were low, so I downed a juice box and practically inhaled one of my running pancakes (which I discovered takes nausea away too!). And when we started running I made a point of not testing them again until at least 10 minutes after taking my first gel, so as not to over react if they were still a bit lower. When I tested them at 55 minutes, they were 6.0, which was alright, but I wasn’t sure if they were going to go up or down, so I had two Sharkies. I tested them again 10 minutes after my second gel and they were 10.2, which was higher, but a safe high for when I’m running. When I tested them 10 minutes after my first 1/2 a pancake, they were 10.9, which again wasn’t horrible. But I didn’t test them again until after the run and they were a whopping 16.7 – yikes! Really hoping I have it all figured out before race day!